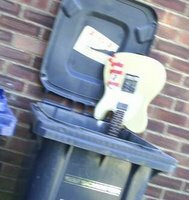 Mills' guitar is no more. It has died, smashed to the floor of a Peterborough stage in righteous fury. But its death was not in vain, for this was an heroic gig: A screaming, chaotic mess of punk madness from which we emerged like butterflies forged from cold, hard steel. We were staggering, half blind with sweat and relief, but gloriously alive and with the spirit of punk rushing through our veins like an overdose. First song, Call Centre and people surged in, pushing past the jugglers (!) and heading for the front. Twang! A guitar string breaks. We launch in to Burn, Cambridge, Burn as Mills struggles to re-string in time for his entry three verses in. He makes it and we bounce back, wide-eyed and flailing for Pop Sluts, All There Is and Shoot to Kill. Twang! Another string goes half way through and Mills is forced to improvise as the ending builds out of control and Jack fits and jerks across the stage in a madness. The song ends and Mills, enraged, hurls the guitar to the floor. It has betrayed him! It must die! And die it does. The jack lead is bent. It is replaced but life has left the guitar. It's last battle is fought and it must hang on the wall as a trophy, alive with memories; its very fibre resonanting with the ghosts of half-forgotten noise. There is confusion, cheering, shouts of "live! Live!" from the floor as we try to bring the guitar back from the dead. Briefly it seems it will make it and we launch into Death at the Hairdressers. But there is no sound from the amp and the song staggers along and dies in a swill of noise and confusion. Eventually the promoter hands us a spare guitar (a brave man) and the rock begins again. Stevie Smith and a final, full tilt God Loves Us follow before Jack can take no more and reels off the stage, his throat in ribbons. David, drumming on through a sweat of illness and frustration, finally lets it all go and the cymbal stands fly and crash and shatter. The remains of the bombed out crowd raise a ragged cheer and the gig is done. It will live longin the memory. Thank you, Peterborough and goodnight. Bomb Factory have left the building. When me and Mills arrived, a man was alone in the gig room and dancing in complete darkness to some kind of club classics CD which was so loud it could be heard in Ibiza.He carried on dancing as we spoke to him. Our payment for the gig consisted of two bottles of water.Under teh circumstances, I thought this was quite generous.